Ben Mee could potentially miss the rest of the season with a shin problem. The Clarets centre back, who has skippered the side in the absence of club captain Tom Heaton, sat out the 2-1 win at Watford last Saturday. And he is likely to be out for “a few weeks” as the injury settles down – similar to the one which saw him miss the last four games of last season. Republic of Ireland international Kevin Long will again deputise, as Burnley host Mee’s former club Leicester City at Turf Moor tomorrow, in a game which could go a long way to sealing seventh place and, potentially, a Europa League berth. Dyche said on Mee: “It could possibly be a number of weeks to let it settle down, which is a shame as he’s had such a good season. “It’s basically a deep bone bruise, which he has had before on the other shin, that cost him the last few games last season. 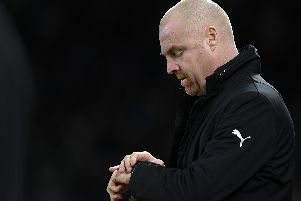 While Mee has been one of Burnley’s outstanding performers this term, and can consider himself unfortunate not to have been rewarded with international recognition, Dyche has faith in Long, who has covered for both Mee and James Tarkowski to good effect: “I’ve been really pleased with Kevin Long, and he should be with himself, he’s matured every season. “He’s a good example of sticking at it, training properly and getting his rewards. “He’s relatively young, not in years, but in terms of his development, and it’s been a massive shift from the end of last season when he came in and got a few games, and went away and played with his country, and has done since. “He’s had 10 Premier League starts this season, which is a good return, as he’s historically not had that many games with us. While the news on Mee is not positive, Johann Berg Gudmundsson could come back into contention after missing the last two games with a calf problem. But Scott Arfield and Jon Walters are not fit enough to return to the squad: “Johann has got a chance, he’s been on the grass since Monday, which is a good sign, so we’ll see how he goes.